Meet Inti, the bravest and sweetest dog in Peru! 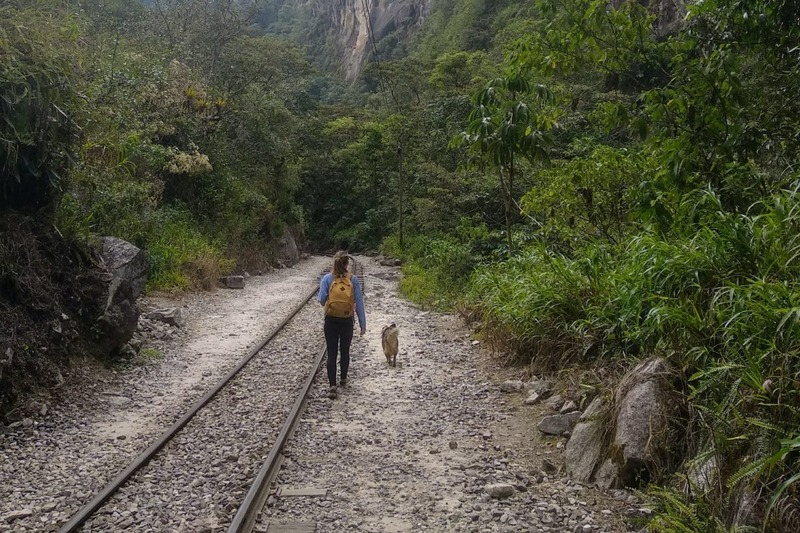 After a three-day trek to Machu Picchu (which was already quite an adventure because of the strikes and protests in the villages on the way) we walk along a train track and I see a seriously injured dog that has been struck by the train along the river. 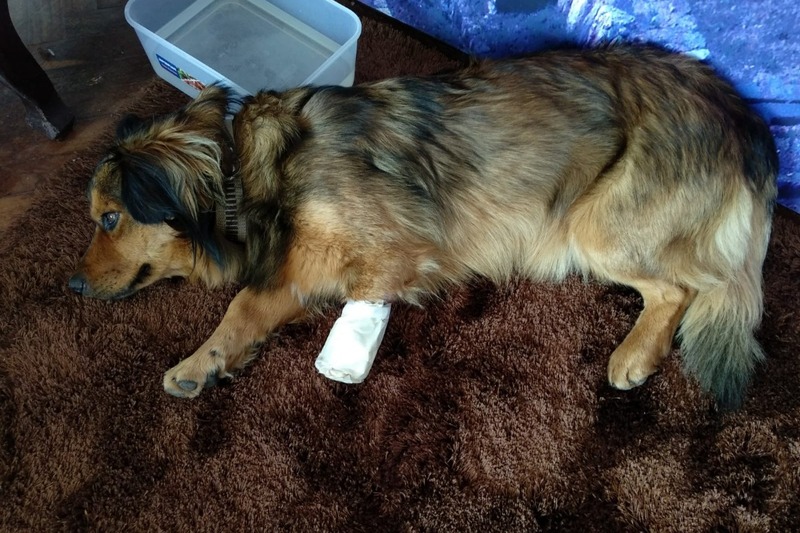 The dog is missing half a leg, he is bleeding violently and his bones are sticking out of his paw. Without hesitation, I take the dog into my arms, and along with my two travel companions Sam and Joshua start walking to the next village, which is still an hour away. On the way, we fortunately encounter a girl with a first aid kit so we can connect the leg a bit. After walking for a while, we waved down a tourist bus who was kind enough to let the dog and I take a ride into the village. Fortunately, I soon see Jelmer and Janneke from our trekking group, who saw the little dog with all four legs happily chasing butterflies just half an hour before. Together we carry the dog through the whole village by looking for a veterinarian, but it turn out that the little village doesn’t have one. We have decided to called him ‘Inti’ in the meanwhile, which translates from the Quecha (Inka) language to mean 'Sun’ because he really is a ray of sunshine. Everyone he encounters has been touched by his friendly face and loving spirit. 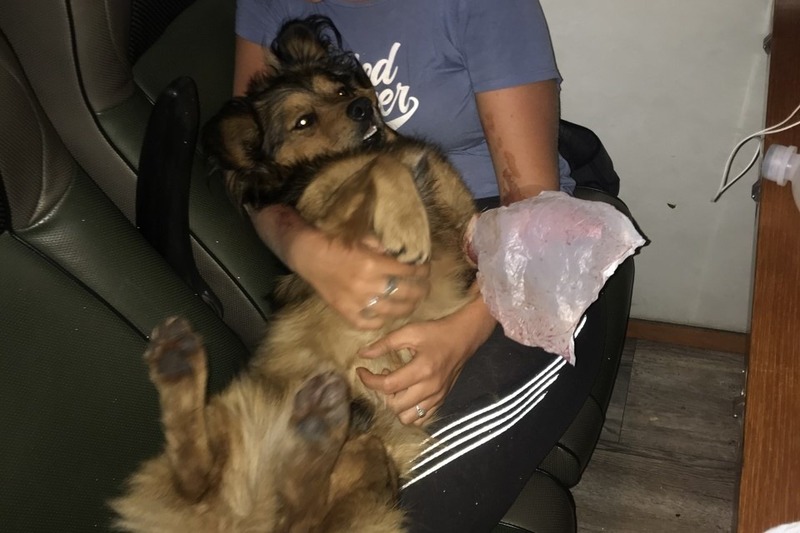 We were determined to find help for this dog and ventured through three clinics all rejecting us before we found a kind hearted human doctor who helps us to contain the wound temporarily. 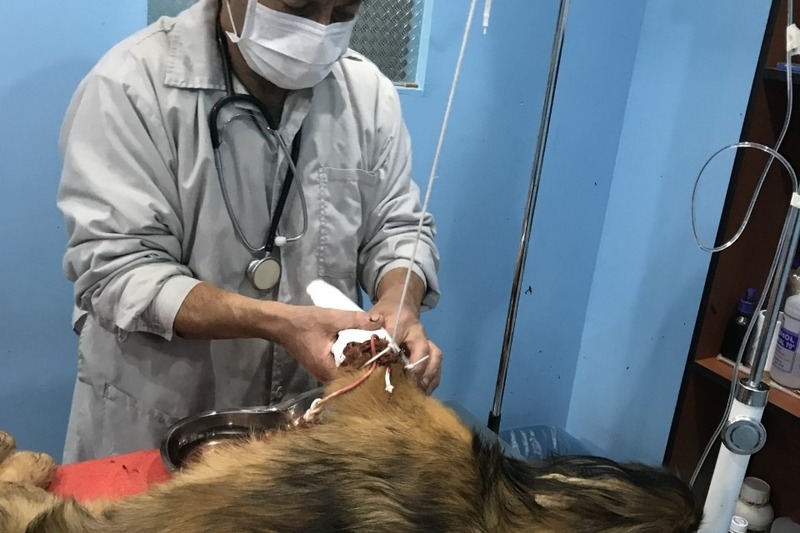 The doctor went a step further and arranged a veterinarian in Cusco, a bigger town six hours away. 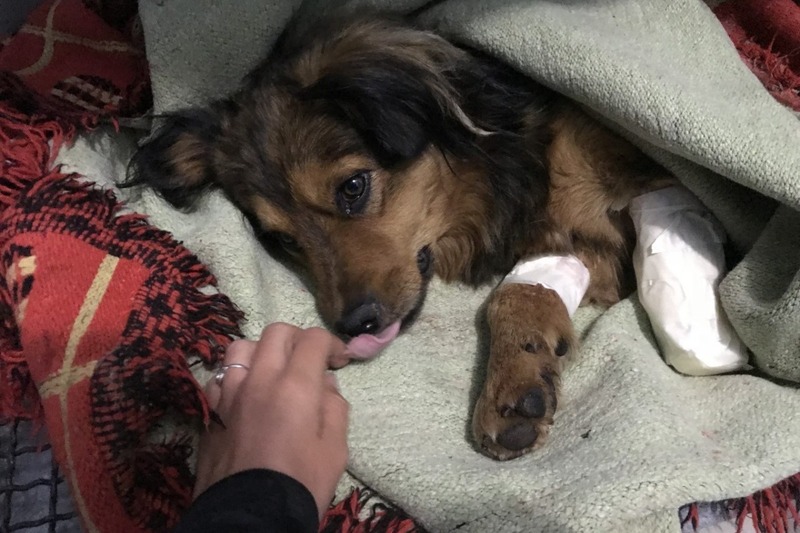 The veterinarian agreed to do an emergency operations immediately and I decided that I will take a train back to Cusco from the village that evening to save what remained of the dog’s paw and any other possible injuries he could have sustained. 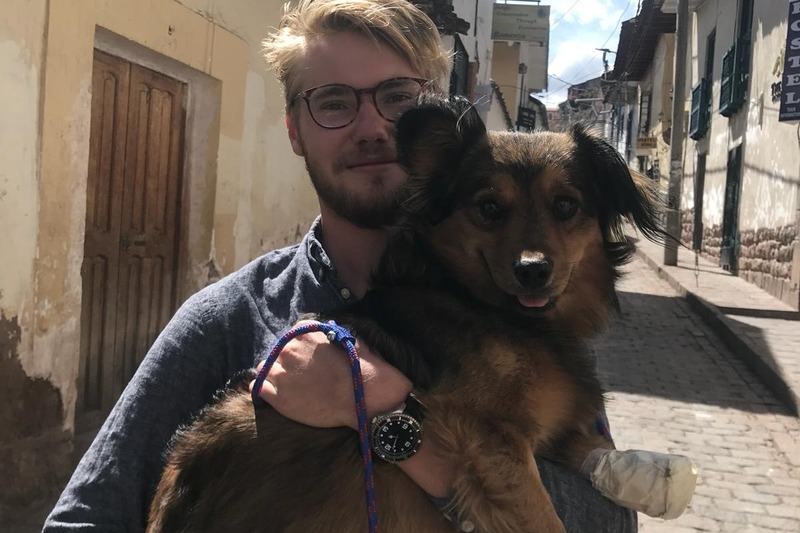 After overcoming a tremendous amount of obstacles to be able to travel with Inti, we finally managed to get on the train to Ollantaytambo and onto a taxi to Cusco in the middle of the night, where the vet is waiting. 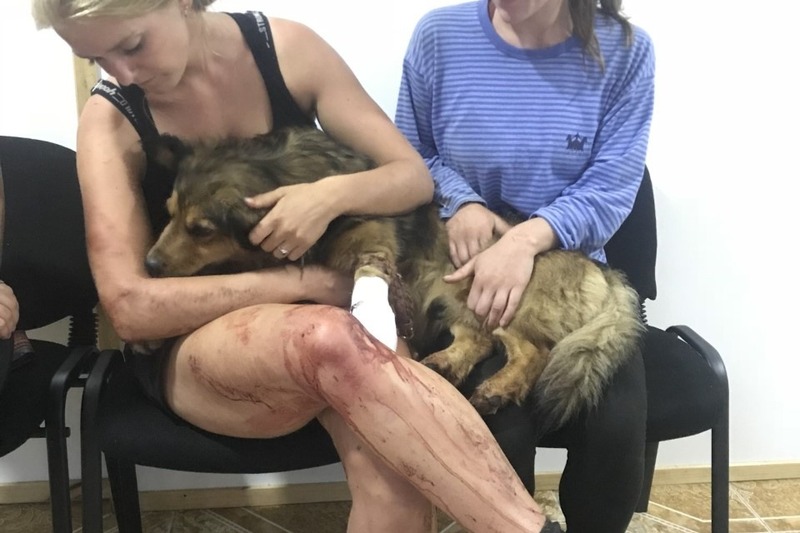 The wonderful veterinarian, Walter, who calls himself a 'dogtor' operated immediately and amputates his paw, the operation took three hours from 0:30 am to 3:30 am. Afterwards, Inti slept and the next day, Janneke and I can pick him up at the dogtor. Inti is recovering and making progress as we speak. It will take time to adjust to his new body but I can see that he is trying his hardest. Now a new question arises; What are we going to do with Inti? 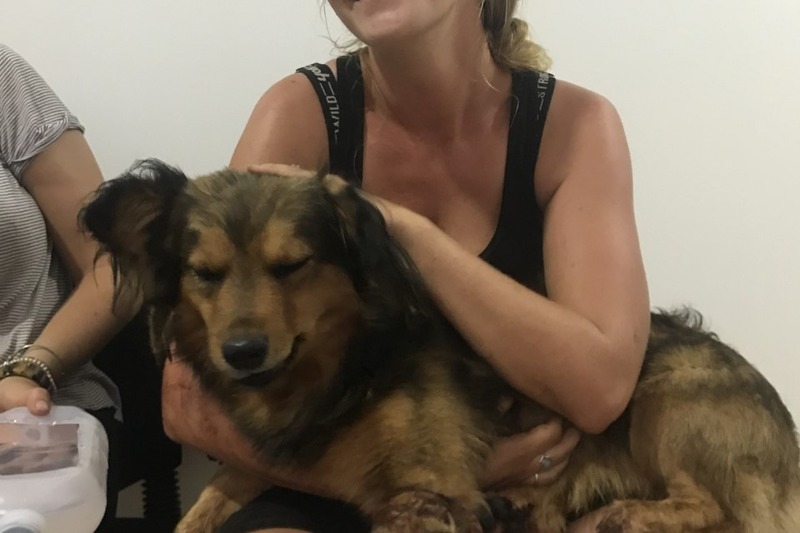 At the moment we are staying with Inti in an AirBnB in Cusco, but being a street dog with a disability would be far too difficult for him at this time of healing so we want to give him a home in the Netherlands to provide him with the love and care that he deserves as he recovers from this terrible incident. Inti is genuinely the sweetest dog we’ve ever met. However transporting a dog from Peru to the Netherlands isn’t cheap, that’s why we ask you for your help on World Animal Day! Met Inti gaat het goed! Er wordt heel goed voor hem gezorgd door dierenarts Walter! Onlangs is de bloedtest gedaan dus die wordt nu onderzocht in het lab, nu alleen nog de resultaten afwachten! Als alles goed is, dan is het dan alleen nog maar de tijd “uitzitten” tot Inti mag vliegen naar Nederland! Binnenkort zal Inti tijdelijk bij een heel lief meisje in Lima gaan wonen, en zij zal ook zorgen dat Inti heelhuids (nouja, min één poot dan) op een vliegtuig naar Amsterdam wordt gezet! Spannend allemaal, maar vooral fijn dat het zo goed gaat met Inti!! Zijn pootje is ook mooi geheeld en hij huppelt vrolijk rond!